ELKHART, IN, UNITED STATES, December 11, 2018 /EINPresswire.com/ -- LunarGlo’s majority owner Judy Barton isn’t getting much rest these days as she’s been busy fielding inquiries and shipping their proprietary solar powered lights and vents to customers as far away as New Zealand, the Middle East and Europe. The LunarGlo® website explains that each lighting unit recognizes sunlight and automatically turns on the light with darkness, and then off when not needed. LunarGlo® Solar Lights are capable of providing up to 80 hours of continuous light from one full charge of a high-quality Lithium-Ion Battery that's hard wired to eliminate any potential for vibration or shock related downtime. The oversized solar array will fully charge the battery within 16 hours of direct sunlight to power the four (4) LED bulbs emitting approximately 72-foot candles of reliable LED light. Click here for Products, applications, and installation. 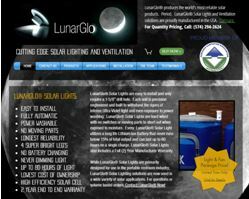 With several years of engineering, design and development work in the area of high quality solar lighting solutions, LunarGlo® was formed to manufacture and supply LunarGlo® Solar Lights to specifically meet the needs of the portable restroom industry. Made in the USA, with the highest quality components, LunarGlo® Solar Lights are fully automatic, power washable, operate for up to 80 hours on a single charge, and are backed by a full two-year warranty. Other LunarGlo® products now include the LunarVent solar powered vent fan, as well as mounting hardware to adapt LunarGlo® Solar Lights a wide variety of applications including pier lighting, garden, walk-way, and patio lighting. Complete details can be found at www.lunarglo.com. Established in 2003, Precept Partners provides Internet strategies, website design, development and online marketing services to clients in e-commerce, retail, manufacturing, healthcare, technology, the arts, and not-for-profit sectors. Recognition for their work includes coverage in The Wall Street Journal, BusinessWeek, NPR, and Inc magazine, with client awards that include the Inc 500, the Internet Retailer 500, the Hot 100 Best Retail Websites award, the Webby award and many others. More at www.PreceptPartners.com.